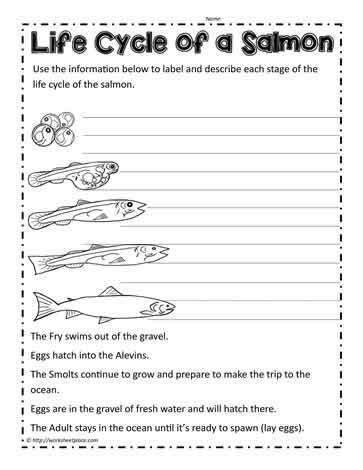 The life cycle of a salmon worksheet. Eggs are in the gravel of fresh water and will hatch there. Eggs hatch into the Alevins. The Fry swims out of the gravel. The Smolts continue to grow and prepare to make the trip to the ocean. The Adult stays in the ocean until it?s ready to spawn (lay eggs).